Many, many thanks to those of you who've offered remedies to my overzealous allergies. I was tempted to follow all your advice, but on further consideration, decided that might not be the best idea either. 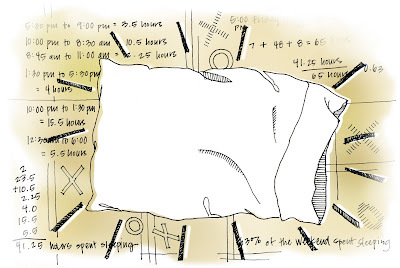 However, seeing as how I spent what felt like the entire weekend with my head glued to my pillow, I took it upon myself to calculate the actual amount of hours I spent sleeping. According to my calculations, I slept 41.25 hours or 63% of the weekend with my longest sleeping stint taking me from 10 pm to 1:30 pm the next day. It's a wonder I don't have bed sores. I've just "found" your blog by way of ThePioneerWoman and wanted to stop by and tell you that I absolutely LOVE it! It's just so much fun and your words and art are beautiful. I love it! Sleeping is the best - especially on the weekends - or any time really! Hey...... maybe your are alergic to your pillow! Could it be time to buy a new one? Love this sketch. 63% is that all? Woman you have no idea the pleasures of sleep you've been missing. You should try to work you're way into the 70's or 80's sometime. Don't wake until you've hit the over sleep headaches. That's the only time you have to draw the line. Actually you only have to draw the line when ibuprofin won't kick the oversleep headache. Sleep, next to food, is one of the greatest pleasures in life (as your other readers have noted). I consider anything less than 10 hours a night to be a mere nap. I love the pillow and math drawing! And I can so relate to the allergies! I was out painting last weekend with a lovely view of miles of hills covered with dry grass. The gusts of wind blowing my way from over the hills was refreshing in the heat...until I started sneezing uncontrollably and my nose wouldn't stop running. If only I could have slept...but the symptoms continued all night. I haven't had an attack like that since high school.